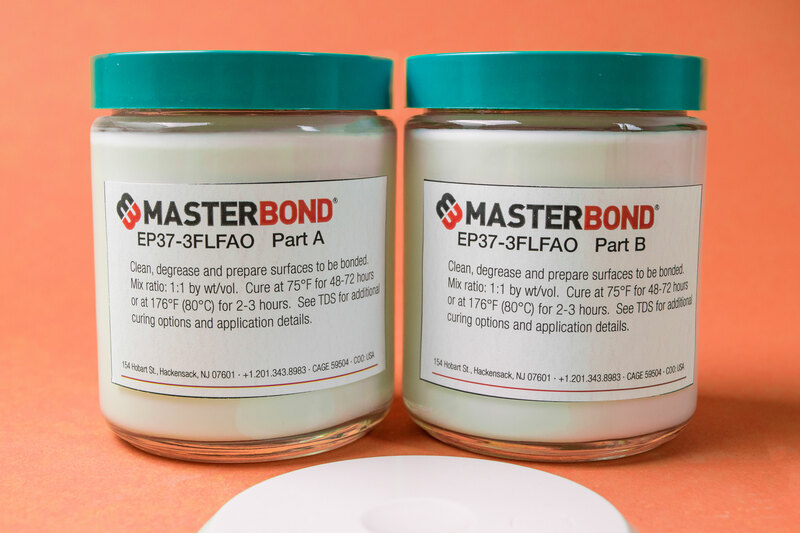 Master Bond EP37-3FLFAO is a two component system for high performance potting, bonding, sealing and coating that is formulated to cure at room temperature or more rapidly at elevated temperatures. It has a convenient one to one mix ratio by weight or volume. It has an unusual blend of properties including high thermal conductivity, excellent electrical insulation properties, good physical strength and a high degree of flexibility. Once cured, the epoxy exhibits striking resistance to shock, vibration, impact and thermal cycling. It withstands many chemicals including water, oil and various solvents. It is a wonderful adhesive that forms strong, flexible bonds to a wide variety of substrates including metals, composites, ceramics and many rubbers and plastics. EP37-3FLFAO has low viscosity with excellent flow characteristics making it ideal as a thermally conductive potting epoxy. It is cryogenically serviceable over the wide temperature range of 4K to +250°F. Parts A and B are off-white in color. Master Bond EP37-3FLFAO is widely used in the electronic, electrical, computer, opto-electronic, aerospace and specialty OEM industries where electrical insulation and heat transfer are required. The uniqueness of EP37-3FLFAO lies in the fact that this thermally conductive system retains a high level of flexibility while having the desirable physical characteristics inherent in epoxies. EP37-3FLFAO has been certified by NASA as a low outgassing epoxy. EP37-3FLFAO is available is various sizes and units to accommodate customer's needs.